Recognizing that music is essential to the human spirit, The Michael O’Neal Singers organization improves the quality of life of its singers and audiences through performance of choral repertoire that engages, educates and enriches. Performances are held at Roswell United Methodist Church, 814 Mimosa Blvd in Historic Roswell, Georgia, except where indicated. Sunday, October 14, 2018 at 3 p.m.
Sunday, December 16, 2018 at 3 p.m.
Sunday, February 24, 2019 at 3 p.m. The Michael O’Neal Singers provides a unique opportunity to the north metropolitan Atlanta community to experience choral performances of artistic excellence & programmatic variety. 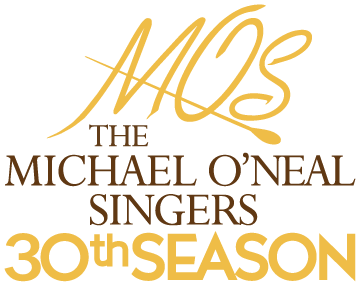 Click the button below to purchase tickets to The 2018 – 2019 Michael O’Neal Singers Season. Tickets available for all concerts. MOS holds auditions each summer for positions in the full chorus for the following season (Sept – May). Auditions are open to interested professional & amateur singers dedicated to achieving excellence in choral performance. This program is supported in part by the Georgia Council for the Arts through the appropriations of the Georgia General Assembly. GCA also receives support from its partner agency – the National Endowment for the Arts. Partial funding for this program is provided by the Fulton County Board of Commissioners. Partial funding for this program is provided by the City of Roswell under the guidance of the Roswell Arts Commission.